...Notes from Vicki: It's Almost Here! Exactly one week from today is the beginning of Ramadan! During this month, the majority of Muslims will celebrate this spiritual time with fasting and insha’Allah a symbolic cleansing of the soul. Subhan Allah two years ago I experienced my 1st Ramadan. As a new Muslim I was so excited! But not for the reason you may think, because I mostly heard about the worldly part of this blessed month. Sisters would tell me the fasting, probably being difficult the first few days, would become easier insha’Allah as the month continued. This was said in a matter-of-fact kind of way not giving much emphasis on the true meaning of fasting. As a new Muslim of only six months at that time, I was like a student, following my sisters for guidance. So what did elicit the most excitement? It was the planning of the meals! I felt the meals during Ramadan had to be greater, and larger than any other meal experienced during the entire year! Recipes from the old countries [back home] were being emailed and translated from one relative to the next. The search for the perfect lamb or goat was essential. Sweets were being prepared days in advance, while the children counted down the days until receiving their Eid gifts. I would call some of my sisters, and could hear the stress in their voices to finish cooking. The second the sun had settled below the horizon…it was on! Iftar (the meal after sunset) is meant to give thanks to Allah [swt]. The purpose of eating iftar is to have just enough to end the pangs of thirst and enjoy family and friends insha’Allah. Eating until you physically can not take another bite or sip or water, is never good. We should weigh less after a month of fasting – not more LOL. The next “important” thing I learned was making sure to get my dress early. “What dress I asked?” Feeling a notable awkward silence, it was explained, usually sisters will by a new dress for themselves and new clothes for the entire family. Sorry husbands, but I hear you have to participate also in getting new clothes. 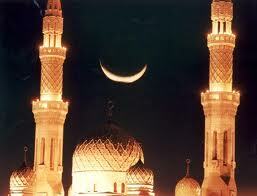 Eid is the Festival of Sacrifice and marks the end of Ramadan. So that was my 1st Ramadan, and it was nice and I was excited but not for the right reasons. Just as I had searched for Islam, I also had to discover the heart of Ramadan. It is to ask for the repentance of past sins and mistakes. We are to ask forgiveness from one another if possible. If this is not feasible, then our intentions should reflect a sincere change for the better. Reciting the entire Qur’an is also performed during the month insha’Allah. In case you’re wondering, I never bought a new dress for that 1st Eid or the next. And while my meals were simple, it was the idea of millions and millions of Muslims across the world united that truly fed my faith. To my new revert sisters and brothers in Islam, I pray for your trials to be few but Allah knows best. There is nothing we can do that Allah [swt] will not forgive except associating others in worship to Him. For all Muslims, insha’Allah we will leave behind our past faults. And start the New Year filled with hope. May we each live to see this Ramadan. I love you all for the sake of Allah [swt]. well alhamdulillah for me its both, i try to do a lot of ibadah in ramadan as well as have good food at iftar..
actually before ramadan comes i m cleaning the whole house from all possible angles, and also preparing some snacks and freezing it. i agree its not at all good to eat too much at iftar. as for eid my dress is already bought and kept. do try and buy a new dress for eid, we might buy new dresses on some other occasion or not so special day, and when it is such a special day , a day for making a special prayer and thanking Allah, we should wear a new dress if we can, even on fridays we are supposed to wear our best so why not on eid. so dear inshallah we have a great month ahead, lets do a lot of ibadah as well wear our best. its not necessary to limit ourselves to wear best only on eid, many people wear good or new dress on 27th night or the last 10 days, when they are staying awake and doing ibadah, they want to look their best infront of Allah. As always you provide a complete view of the situation. Perhaps if I had seen more of a balanced approach towards, Ramadan it would have left me with a different opinion. Your right sister providing our best for Allah swt everyday is what is most important. Ramadan Mubarak to you and your family!